This article analyses the economic landscape in Poland. It presents the figures that led FTSE Russell to review the outlook on this no-longer-emerging market. When discussing The FTSE Quality of Market criteria, the author focuses on parameters improvement, which resulted in the upgraded outlook of the Polish economy. The next paragraphs focus on more general factors and macroeconomic data, which led to today’s results. Job market data and GDP growth composition are analysed with respect to comparable in other countries. 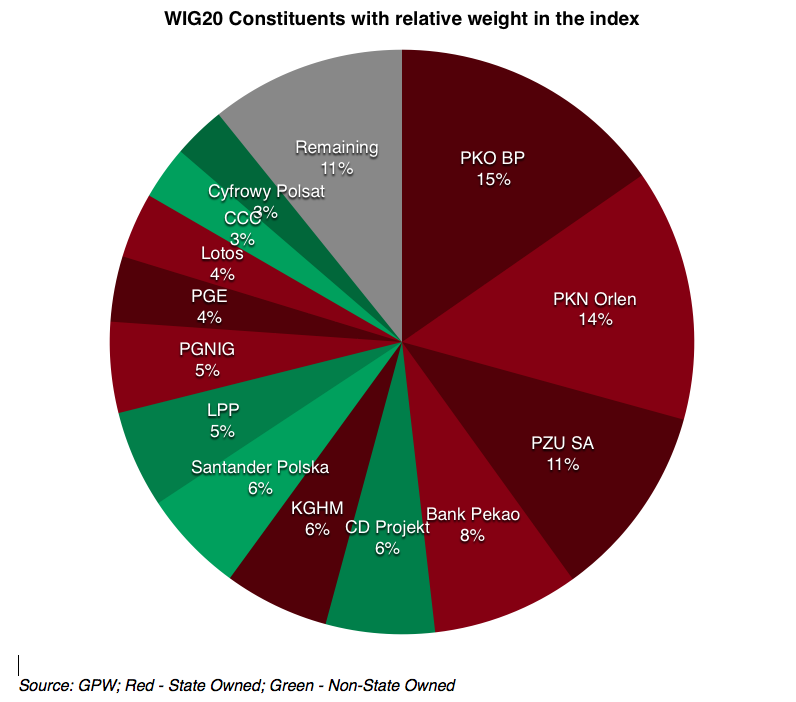 In conclusion, the reader has a chance to better understand the blue-chip Polish index WIG20 together with its growth parameters, constituents and its regional characteristics. Closing paragraph includes recommendation with some insight from a Polish national. For the purpose of this article Poland will be compared with Hungary, representing emerging markets, and Germany and Italy, representing developed economies. “Following the recommendations of the FTSE Country Classification Advisory Committee, Poland will be reclassified from Advanced Emerging to Developed Market status with effect from the September 2018” was announced in September 2017 by the FTSE Russell representatives. The significance of this statement comes from the fact that this is the first instance of such advancement for a decade and Poland has also become the first former communist satellite state to be ranked as developed economy. In order to join the index comprising economies such as Germany, USA or South Korea, Poland had to meet 21 out of 21 Quality of Market Criteria. The list of those criteria includes “High Income GNI”, “Free and well-developed equity market” and “Developed Derivatives Market”, among others. Key parameter for Poland was the “Availability of account facilities for international investors”. In the period between 2015 and 2017 this condition has been met, finalising the process of obtaining all 21 criteria. This implies that Poland will leave the FTSE Emerging All Cap Index (where its weight, as of March 2018, was 1.33%) and join the FTSE Developed All Cap Index, where its index weight is projected to be 0.154%. After this announcement however, one may question what does it practically mean and what quantitative changes can be found in Polish economy to explain FTSE Russell decision? Located in central-eastern Europe, Poland is the 8th largest economy in the European Union and with population of over 38.5 million is ranked 9th most populated country in Europe. Throughout last decade, Poland experienced strong economic growth with 2017 bringing 4.62% increase. In the first two quarters GDP grew another 2.5%, in line with total expected growth of 4.6% (European Council after revision from 4.3% in July). Good economic results can be attributed to steadily growing consumption and investment and overall healthy composition of the domestic product. The following graph depicts data on the changes of GDP constituencies over 2017 in Poland and comparable economies. It may also be observed that Poland’s GDP growth resembles Germany in terms of proportions of the parts. It may be assumed that high growth is also the result of steadily increasing disposable income. Between 2009 and 2018, average gross salary in all industries grew by 44% to its current level of 4825 PLN (equal to about 1125 EUR). This number should be juxtaposed with Core CPI Price Index that grew by only 11% through this period. Low unemployment was among the reasons of high pressure on income growth. With over 1 million Poles emigrating to UK, Poland’s unemployment reached an all-time low of 6.6% in 2017. Higher average level of income benefited Polish companies exposed to increasing consumption as well as the state treasury with budget revenues growing from 250B PLN in 2009 to 350B PLN in 2017. It should also be remarked that in 2009 Polish economy was one of the few European economies to avoid recession achieving 1.9 YoY GDP Growth (in comparison, average EU GDP fell by more than 4% during that year). Monetary and fiscal policy are both key elements to get full understanding of Polish economics. Poland is obliged to adopt Euro according to the initial agreement of The Treaty of Accession from 2003. However, the treaty does not specify any period for the adoption, hence Polish government decided to stay with its national currency and full monetary control. Polish Central Bank NBP has historically been more hawkish to avoid repeating hyperinflation that Poland was facing after the dissolution of the Soviet Union in 1990 and 1991. The NBP referential rate is equal to 1.5% (since 2015) and 10Y Polish Bond yield is equal to 3.24% (as of 29th September 2018). In terms of fiscal policy, Poland kept the Debt to GDP ratio relatively low at the level close to 50%. This may be attributed to relatively high cost of borrowing for the economy from the outside of the eurozone as well as quickly growing GDP. Public deficit for 2018 is estimated to be equal to 1.4% GDP and will be lower than the initially expected 2.3%. This is the result of positive global economic situation and unprecedentedly high revenues from VAT after the government campaign against tax evasion and corruption, especially in energy industry. The aforementioned data are summarised in the table below. Is There Room to Make Money on Polish Growth? The easiest way to invest in Poland’s economy is through the Warsaw Stock Exchange. Main Polish index WIG20 comprises 20 biggest Polish companies with respect to market capitalisation with additional requirements regarding representation of each sector in the index. Instinctively, after objectively substantial fundamental data and good market conditions globally one might expect WIG20 to present somewhat predictable growth. However, that is not the case. With PE ratio equal to 11.76 and P/BV around 1.2, Polish stock market has been underperforming since financial crisis. Suffice to say, that WIG20 never get close to historical max around 4000 points from 2007 and is now oscillating in 2000-2500 point region. One reason might be the small size of Polish stock market. With market cap of only slightly above 90B Euro WIG20 proves Polish blue-chips to be relatively small on the international scale. Out of mentioned 90B only 58B Euro is free floating. Another point, closely related to small size, is government reform conducted in 2013. As the result billions of PLN has been moved from obligatory pension funds investing the money on the stock market to government fund used for financing ongoing retirement program. This decision convinced both domestic and international investors that Polish government has very extensive power over the capital market in Poland. Another point is the structure of the ownership among the 20 companies from WIG20. In 12 of them Poland’s Ministry of Treasury exercises full voting rights, including top 5 biggest firms. This represents 78% of the capitalisation of WIG20. What are the practical implication of such policy? However, it has to be said that relation between the government and state-owned companies is quite unorthodox. Polish PM Mateusz Morawiecki has financial background and his last position before joining political scene was the CEO of local Polish bank BZ WBK owned by Santander. His appointment was understood as a direct signal that economics would be the uttermost priority for ruling party. As the result most of the State’s companies performed at the unprecedentedly high-level last year. The result was the growth of WIG20 driving the whole Warsaw Stock Exchange performance to YoY increase of 28% in 2017. 2018 brought large correction and sudden outflow of capital from emerging markets was very noticeable. However, Polish stocks will probably keep growing their fundamentals for this year and the following. The data below present WIG20 compared with other indexes. Poland is currently in an interesting position. On the verge between emerging and developed, with its national currency and stock market peculiarities. Fundamentally healthy, although facing many structural and political difficulties. With plenty of opportunities has at least as many threats. For many years protecting its growth, now it is starting to build companies with international potential such as CD Project or CCC. Placing capital in this economy seems to be justified for investors focused on fundamentals. 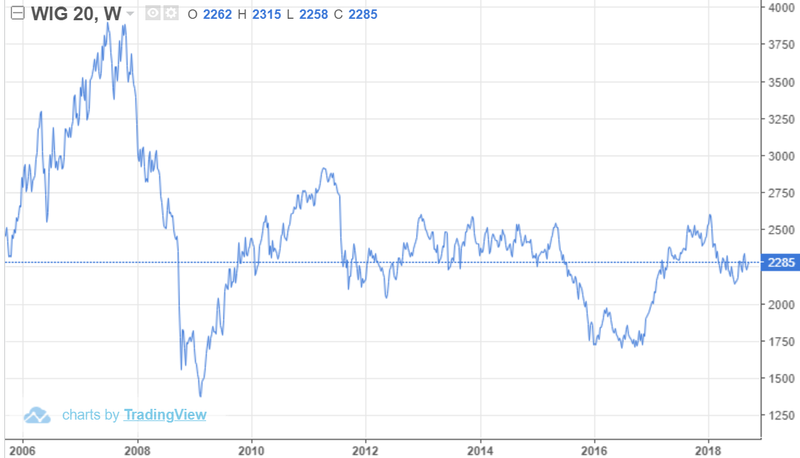 Poland proved to be relatively resistant to global recessions and this may be additionally useful now, when concerns about the global correction, to say the least, are raising. Final piece of advice is to take a good look on the pie chart above before investing. Is Poland’s government able to manage many different companies? Perhaps they have what it takes? Then… All red!